Wouldn't it be incredible if we could look into the future? Just a teeny, tiny, little bit? Imagine the guidance and clarity we would have. Then again, Forrest Gump's much-loved quote, "Life is like a box of chocolates, you never know what you're gonna get" wouldn't be so true, would it. Clarity, or, surprises? I'm not sure which I would prefer, honestly. Take a look at my 2017 year, for example. If someone had told me I would win multiple Female Vocalist Of the Year awards in 2017, I am not sure I would have believed them. To win Texas Country Music Awards' Female Vocalist of the Year and East Texas Music Awards' Female Vocalist Of the Year, along with several other awe-inspiring awards was hands-down the most thrilling experience of my 2017 for me and my music team. And, it came as a surprise, which made the honor all the more sweet. Yes, 2017 was full of sweet surprises. It was also a year in which I experienced growth. I grew as an artist, and, I grew as a person. My entire team at Holly Tucker Music grew. Together. And for that, we feel incredibly blessed. 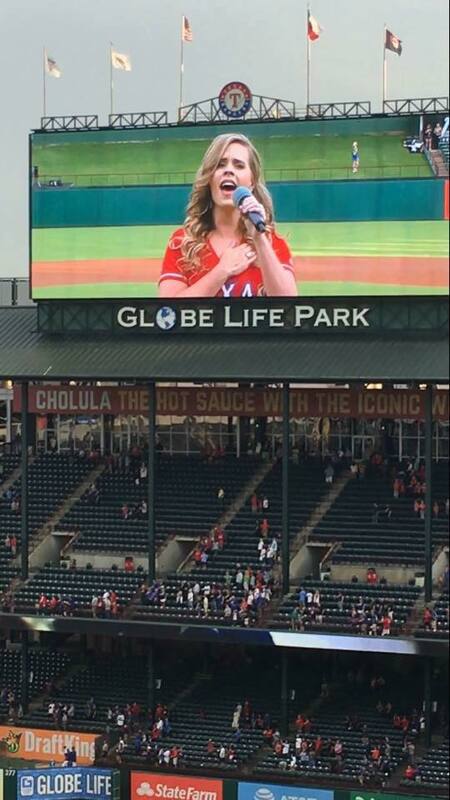 In 2017, I also had the proud opportunity to sing the National Anthem for several sporting events, including the US Women's Nationals Soccer Team, Texas Rangers, University of Texas and Baylor University. How incredibly humbled I was to look at our nation's Stars and Stripes, hand over heart, and sing to its beautiful glory. In addition, 2017 delivered bucket-list experiences to me. I got to shared the stage with some of my musical heroes; Restless Heart, Kevin Fowler, Roger Creager, Curtis Grimes, Wade Bowen, Tracy Byrd, Parker McCollum, Ray Johnston Band, Bri Bagwell, and more. Now those were major moments. In 2017, not only did we play over 150 live shows, we got to these venues on some new digs! We got a killer deal on tour bus that enables my team to travel, create, problem-solve, and laugh together as we roll down I-35 or across Texas on Highway 90. Meet Silas, our new Tour Bus affectionately named after my Grandpa who inspired my family and I to all follow this road that leads to music. Also pictures: Gemma, whose yawn is much scarier than she. 2017 also brought me the chance to do some serious reflection on my music, career, and most passionate goals. As I scratched each one off my list, only to create a larger, more dynamic goal, I saw progress and improvement. To know me is to know I am very tough on myself - on my craft. Anyone else like that too? When I hear video playbacks of my shows or come across my song on the radio, I listen with critical ears looking to hear, not perfection, but growth. When I catch a glimpse of my Dallas On Your Boots video, I watch with the eyes of a hawk. Did we get the lighting right? Did our story board convey the song well? How is the video being interpreted by others? Was my hair and makeup on "fleek"?! Total girl thoughts. Bottom line, though, I provide, and I ask my team to provide, constant checks and balances on our work. Our ultimate goal is to make music that you want to listen to, while remaining true to who we are at the very core. All this personal reflection I do at a year's end isn't always easy but it is necessary. It helps me grow and dream of new goals and plan even larger musical endeavors in the days ahead. A banner year in 2017 only set the stage (with full lights of course) for an even better, 2018. It is already off to an awesome start. In January, the Holly Tucker Music team raised $4,300 in a campaign we called #MartinGoesToHarvey for Hurricane Harvey relief funds. I relentlessly reminded as many people possible (thank you for watching, sharing, and showing my social media posts so much love) of the continued needs of our neighbors in Houston and along the Texas Coast who, today, as I write this, are tirelessly working to rebuild, months after Hurricane Harvey swept through. I wanted them to know that we haven't forgotten them. After Harvey wreaked havoc on our coast, I happen to be gifted a gorgeous Martin guitar and a simple request to "do something good with it". My "do something good with it" was this idea to gather signatures from as many Texas Country Artists possible on that guitar. Everywhere my Steel Tour took me, so went the Martin. After nearly four months of gathering signatures from some pretty amazing and generous artists, I set up an online raffle site and campaign asking folks to purchase raffle tickets for the Martin. And they did. One of these generous purchasers was Jorge Uresti, of Houston. On January 28, Jorge's name was randomly drawn to win the Martin! I think it's very fitting that this beautiful guitar go back "home" in a sense. We have special plans to celebrate with Jorge and his family, and I will keep y'all updated on my socials! Remember, surprises make every wait so worth it, don't they? First and foremost, you can expect new music from me! It is in the works and will be shaped, cultivated, and crafted throughout this year. I cannot say too much (though I so want to!) but let's just say I happen to be talking with some incredible talent whose gift to produce music is above and beyond. Remember that goal-setting and dream-making I like to do? This is definitely bucket-list worthy, y'all. Next, Spotify, Spotify, Spotify. While I spent much of 2017 on stages and in venues throughout Texas, Louisiana, Oklahoma, and more, I will be making my music more virtually available in 2018. Much of this year will focus on releasing cover singles exclusively on Spotify. These are song favorites like Tennessee Whiskey and I Will Always Love You. I am releasing a new cover single each Friday though March. #EverySingleFriday. Before, you would have to head to YouTube and hit refresh or replay over and over again to hear my version of these covers. Now, you can stream your favorites and put them right into your playlist for your listening convenience all day, everyday! (hint, hint) If you are not already on Spotify, what are you waiting for? It has become my go-to to stream my favorite new artists and latest song obsessions. It's free (or you can pay a small monthly fee to remove ads). It's convenient. It's where so many rising artists are placing their music. Before I sign off having talked about 2017 highlights and what's to come in 2018, I cannot do either without saying thank you. Thank you, #Hollstars. Thank you, friends. Thank you, family. Thank you, Waco, Dallas, Houston, San Antonio, Austin, Gruene, East Texas, College Station, and beyond. Your interest in my music, your following of my often silly antics on social media, your support for me as I navigate this wonderfully challenging choice to be pursue country music and live out my passion fuels me to do better each day. Tell me, what would you like to see from me in 2018? Hit me up in the comments. I want to know!